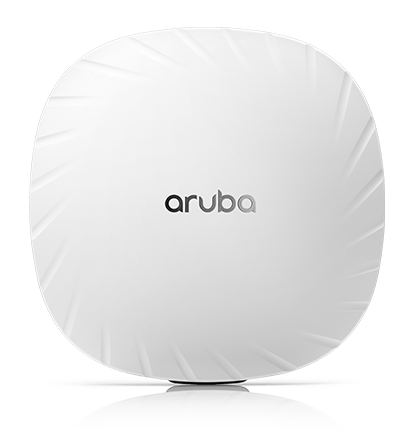 The Aruba 530 Series with 802.11ax (Wi-Fi 6), combined with Aruba intelligent software features are designed to deliver high performance connectivity in extreme density deployments of mobile and IoT devices. The 530 Series is designed to simultaneously serve multiple clients and types of traffic, boosting overall network performance by up to 4X versus 802.11ac APs. In addition to 802.11ax benefits, the 530 Series also provide Aruba differentiated capabilities that include AI-powered RF optimization, always-on connectivity and WPA3 certified security. Additionally, Green AP mode for 802.11ax APs also leverages AI/ML capabilities for energy savings of up to 70%. Aruba’s ClientMatch feature intelligently groups Wi-Fi 6 clients onto the best AP’s to leverage 802.11ax multi-user capabilities. Note: conducted transmit power levels exclude antenna gain. For total (EIRP) transmit power, add antenna gain. AP-534: Four (female) RP-SMA connectors for external dual band antennas (A0 through A3, corresponding with radio chains 0 through 3). Worst-case internal loss between radio interface and external antenna connectors (due to diplexing circuitry): 0.8dB in 2.4GHz and 1.3dB in 5GHz. AP-535: Four integrated dual-band downtilt omni- directional antennas for 4x4 MIMO with peak antenna gain of 3.5dBi in 2.4GHz and 5.4dBi in 5GHz. Built-in antennas are optimized for horizontal ceiling mounted orientation of the AP. The downtilt angle for maximum gain is roughly 30 degrees. Combining the patterns of each of the antennas of the MIMO radios, the peak gain of the combined, average pattern is 1.9dBi in 2.4GHz and 3.5dBi in 5GHz. POE power can be drawn from either port (single source, or set to prioritize) or both ports simultaneously (set to combine) When set to prioritize, the AP draws power from E0 and may failover to E1. When powered by DC, 802.3bt (class 5) POE or 2x 802.3at (class 4) POE, the AP will operate without restrictions. When powered by 1x 802.3at (class 4) POE and with the IPM feature disabled, the AP will disable the USB port and disable the other Ethernet port. In the same configuration but with IPM enabled, the AP will start up in unrestricted mode, but may dynamically apply restrictions depending on the POE budget and actual power. The feature restrictions and order can be programmed. Operating the AP with an 802.3af (class 3 or lower) POE source is not supported. All numbers above are without an external USB device connected. When sourcing the full 5W power budget to such a device, the incremental (worst-case) power consumption for the AP is up to 5.7W ( POE powered) or 5.5W ( DC powered). A mounting bracket has been pre-installed on the back of the AP. This bracket is used to secure the AP to any of the mount kits (sold separately); see the ordering Information section below for details. Mean Time Between Failure (MTBF): 995,000hrs (114yrs) at +25C operating temperature. What is High Power PoE?